Thorlos Thick Ski Socks are specifically designed to provide the maximum warmth, protection, comfort and fit for skiers on a range of terrains, from easy to varied. Anatomically designed terry padding ideally protects all zones of your feet, reducing static pressure and impact, while thick cushioning in shin and instep protects against shin bite. 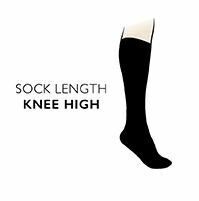 Spandex and targeted cushioning supports the arch, with ventilation panels, along the exclusive THOR•LON® and THOR•WICK® yarn blend creates high performance air circulation and wicking, for blister-free comfort from these 100% US designed and made sports socks. Thorlos Thick Ski Socks are a great choice for anyone using rented boots.